Booktrack has just made it easier for us to buy and experience the next great failed attempt at enhanced ebooks. 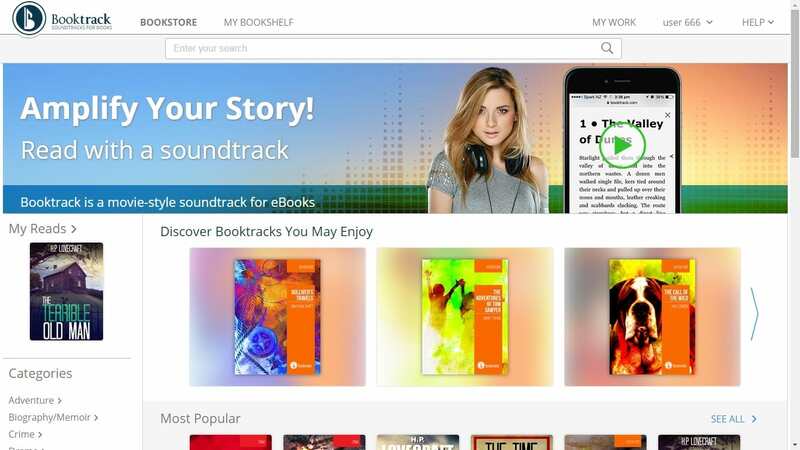 Earlier this week Booktrack launched a bookstore on its site where readers can pay for ebooks which have been afflicted with audio soundtracks. The store currently stocks around 150 titles, out of a catalog of 12,000 titles produced on the Booktrack platform (according to DBW). Most are priced between $2 and $8, and there are a few freebies you can sample (including Hugh Howey's Sand). The ebooks can be read in the web browser, or in Booktrack's apps for Android and iPad/iPhone. They can also be embedded in other websites, Booktrack reports. If you think this sounds distracting, you’re right. I downloaded the (free) version of Sherlock Holmes: The Adventure of the Speckled Band for the iPad to test things out. The first thing you need to do is shut off the progress indicator, or you will feel constantly harried to read at a steady pace. The Holmes novel starts with suitably filmic background music, and the ticking of a clock. Later, we enjoy a crackling fire (or paper being screwed up — it’s tricky to tell through the iPad’s terrible speaker. Headphones are recommended) and later, upon turning a page, I heard the sound of a a drawer being unlocked and a book pulled out. It’s incredibly jarring. The beauty of a book is that the whole world is as real as you can imagine it to be. Adding tawdry effects doesn’t enhance the experience — it just makes the whole thing seem fake. You know how a bad visual effect can pull you right out of a movie? This is the same, only worse. “It’s difficult to imagine a movie with no soundtrack,” Paul Cameron, Booktrack’s co-founder and CEO told Business Insider, “Yet, until today, the technology did not exist to synchronize music and sound within an e-book”. My God, he’s right. Similarly it’s hard to imagine an owl without wings — yet, until today, no-one has thought to graft a beak on to a cow. Again, Cameron nails it: reading hasn’t been fun since kindergarten. Why don’t they make pop-up books for grown ups? Why can’t books be more like movies? Hell, while we’re at it, what’s wrong with moving your lips while you read, or with eating soap? Hopefully Cameron’s next start-up will help us do those things too. Seriously, is this the week all good things die? If I wanted a soundtrack, I would watch a movie or listen to a song. I read a book because I want to read a book. That's why Booktrack's continued operations continue to confuse me. After 5 years and $5 million in capital, I would have thought the startup would have pivoted by now. Other startups certainly have. Vook, for example, launched in 2009 with a similarly unmarketable idea (embedded audio and video), and that company had pivoted three times by the end of 2013. Booktrack, however, is still pursuing the same idea it had in 2010. Either their idea works better than I thought, or they are simply more stubborn. Your blanket statement that the idea of audio-enhanced books is bad is simply too wide. As someone working to make textbooks for learning foreign languages, I think this is a great feature. Being able to listen to the foreign language while looking at the text is ideal for learning. Admittedly a niche market, but who wouldn’t want to make it easier to learn a foreign language. I agree with you that audio can be useful when it is synced to text. In particular, spoken word audiobooks can be very helpful in teaching a first or second language. But that’s not what Booktrack is doing. I don’t mean to imply your opinion is invalid, but I don’t think I made a blanket statement. My criticism focused on audio soundtracks. I hate them. Looks like the mysterious holy grail of enhanced books is still safe from discovery. Booktrack’s attempt to change the reading experience through the application of ‘new’ tech into the ‘delivery mechanism’ (i.e. ebooks) is just one of many over the last few years but it’s probably the most mis-targeted. It’s part of the human condition to tinker with narrative and that includes how it’s delivered. There’s nothing wrong with that but for it to work the personal experience of the new delivery mechanism has to be better than the existing one. Clearly, that’s not the case here. I am hoping this will go the way of scratch and sniff books or, like them, at least find the niche it should possibly be aimed for – books for very small children. First, a definition. For me, an “enhancement” to an ebook is something that makes the process of reading the story better, richer, and more satisfying, without interrupting the story in any way. Changing from black and white movies and TV to colour movies and TV was an enhancement under this definition. You can watch the same movie in B&W or in colour, and it is better in colour. 2. Better software, so that the book designer can better control the typeface, the font size, indents, margins, page breaks, etc. thus preventing things such as having only one word on the last page of a chapter. 3. A SUBLIMINAL sound track. Sounds, keyed to the story that are so faint that you do not consciously hear them. Now I would agree with you, Nate, that a clearly audible soundtrack would be distracting, and thus would take away from my reading enjoyment. A loud soundtrack, therefore, cannot be an enhancement in my opinion. However, I don’t think that a subliminal soundtrack would distract me, if I didn’t consciously hear it. Whether or not it would “enhance” the reading experience can’t be known until someone tries it, and I don’t think that anyone has tried that yet. So, I’m glad that the creative types are playing around with ideas, even if most or all of them fail. I think it is too early to say, once and forever, that it is impossible to enhance reading a book. I have recently written a children’s musical storybook, Murfy Finds A Home, which is available on the App Store and the iBookstore as an ebook. How can it be made available on Booktrack?